Christmas is over, and the new year is only a few hours away (at least here in Norway). We have been back a couple of days, and as we are nearing the new year, I decided I needed one more run towards a declutter goal I had this year, that I haven’t told you about before! And I thought out this elaborate plan that maybe I should shoot for decluttering as many items during 2017 as I have written about on this blog since I started my declutter journey in 2014. So how many items would that be then missus Anne? Well, lets see now – that would be 634 items in 2014, 561 items in 2015 and 437 items in 2016… (mumbling and calculating under my breath… ) – that’s 1632 items! Well here we are, at the last day of December and my total for the year is at 1508 – that’s 124 items away from my imaginary 1632! I’ve been thinking about this, and it probably didn’t matter if I did it or not… but I haven’t been able to get it out of my head.. I really want to get to the 1632! I have a lot of digital decluttering that needs doing, something that will be my main focus in 2018. I decided to cheat and start early, and what better place to start than my iPad mini, which I use every day. So that’s what I did! Just to throw in some actual physical stuff – I figured that shredding a pile of papers that was waiting to go, probably wouldn’t be a bad idea. I have a portable shredder that I use with a specific trash bin. 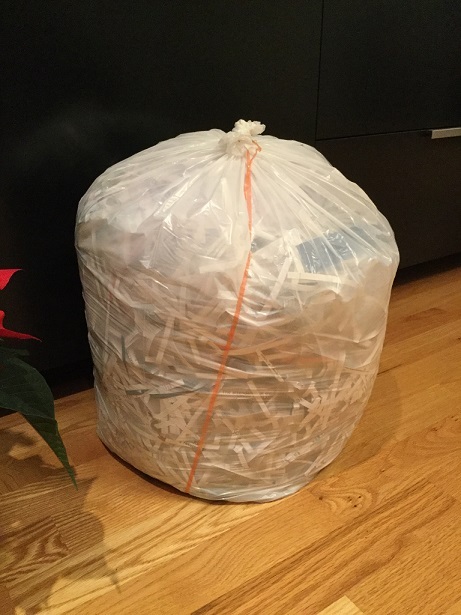 I can typically shred around 200-250 pieces of paper before the bin is full. Food store receipts? Well then we are talking probably 700-800. Since I’m counting items, I have decided that one full bin equals 10 items out-the-door. This time around, it was a mix of regular paper and store receipts, which equals a lot of single pieces of paper. That’s a total of 131 items for today! And my new grand total for 2017 = 1639! That’s it for 2017 – no more decluttering! Let’s see, what I have I been able to shed this month? So what else have I’ve been up to? Not much, except for enjoying the heck out of spring 😉 And I’ve done a major patio overhaul. Month three! My gosh I thought I had spent February focusing on my digital clutter, but February don’t even hold a candle to the month of March. Unfortunately, getting that focused on digital clutter, have taken away some of the focus on tangible decluttering, and it’s time I step it back up in the month of April! 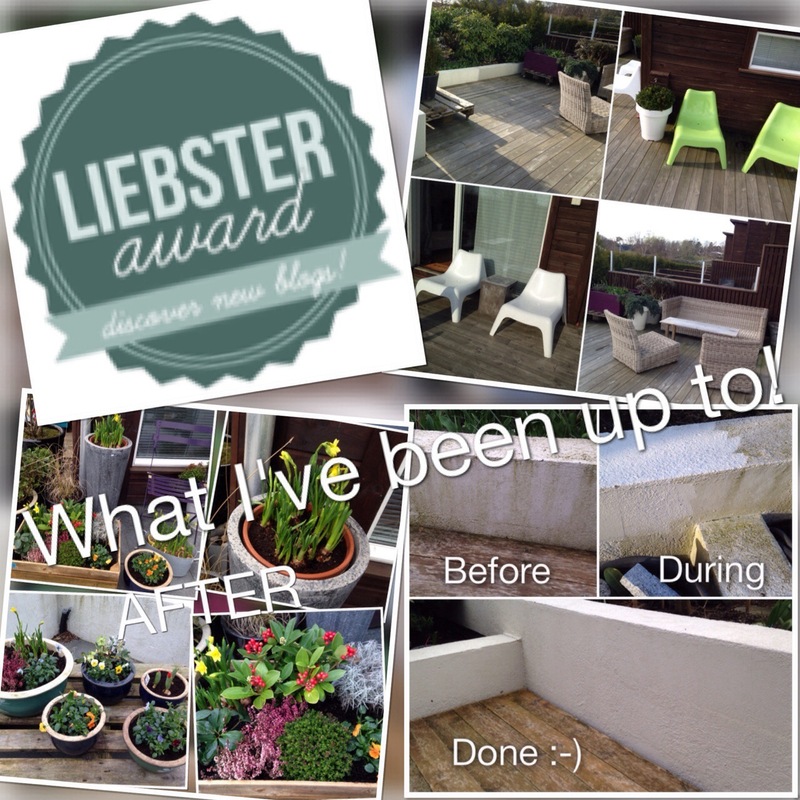 The Liebster award 🙂 I still can’t believe it.. Starting the spring cleaning in the yard. 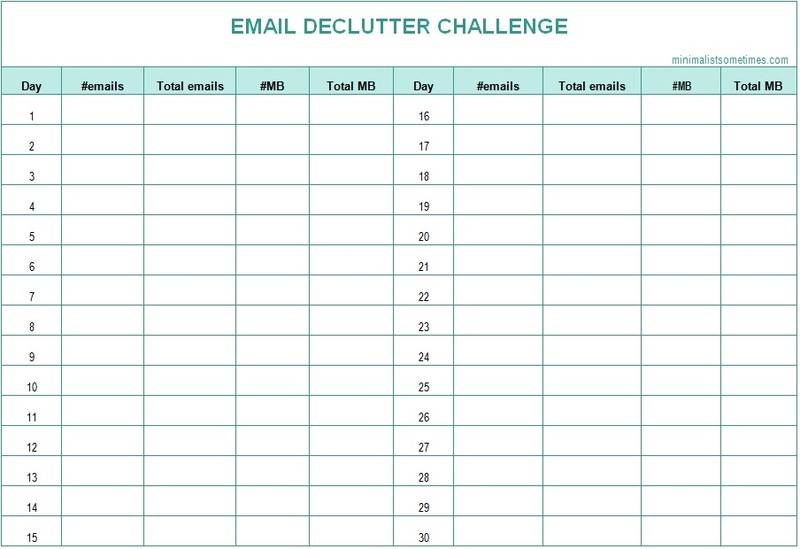 It’s been a month since I posted my email declutter challenge article, where I stated I would try to de-stuff my email at work by at least 7000 emails in 30 days. Actually, it’s probably been closer to 10 000 emails de-stuffed, you see I did a little “boo-boo” in the middle of my clean-up. I wasn’t sure if I had consolidated all emails into my outlook mailbox, so I moved the folder I wasn’t sure about. There were moments it didn’t look like I would make it, I was forever staying put at about minus 1500 emails, but I just carved away some dedicated time, and this morning, I managed to sort out the last ones, that got me past the 7000 mark. 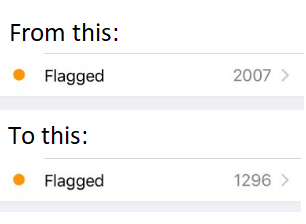 I went from 19592 email down to the current 12061 emails I’m at right now. Thats 7535 less than when I started. Yu hu!!! 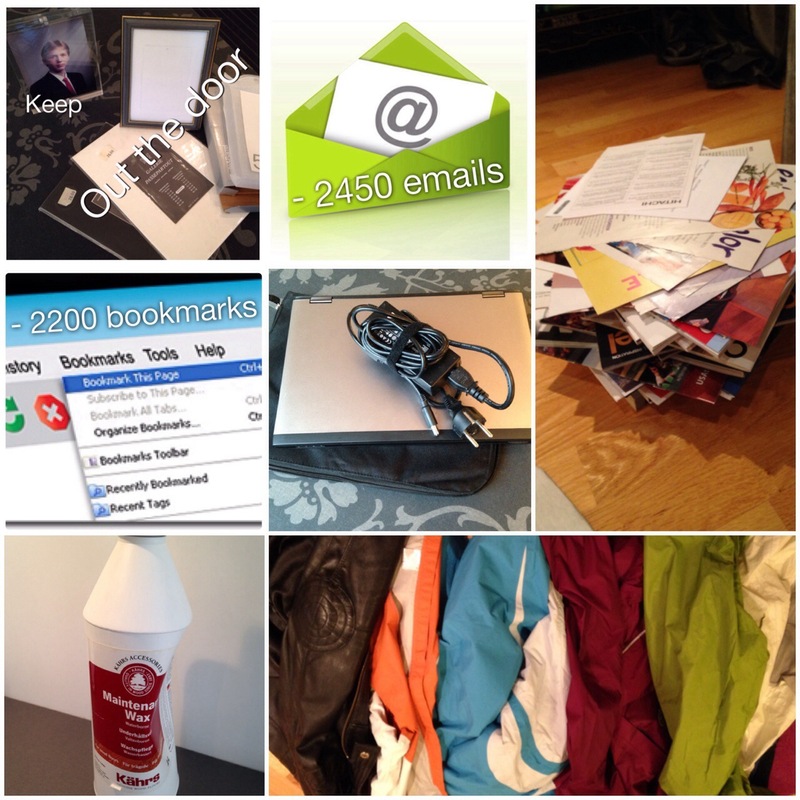 As you can see – I’m still not done, and I don’t think it’s going to get any easier, but since I’m on such a good roll right now, I think I will continue with fase 2 of my email declutter challenge. What is Face 2 you’re asking? Well, let me tell you, it’s another 5000 emails be-gone! And when am I gona be finished? Another 30 days from today…! I’m two months into my declutter challenge! It seems like I have focused mostly on digital clutter during February, but even so, there are a few other items that went out-the-door! Below is an overview. You will see that some I count as one item, and some I count as individual items. I believe I need an email declutter challenge. I’m completely into email overload, especially at work. I have lost all control, and looking at the 1211 unread email is just about to drive me nuts (yes, even more so, than I already am 😉 ) Talk about stress factor. As I write this I have 1,45 GB worth of emails in my work mailbox, amounting to 19592 individual emails! What on earth!!!! 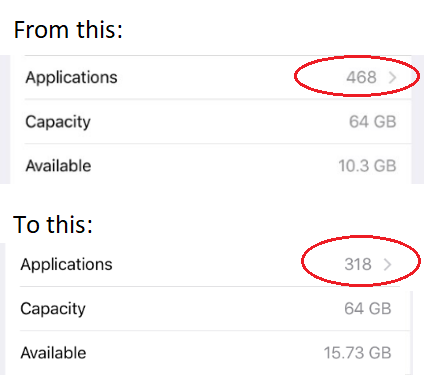 My goal for this year – reduce to less than 500 MB worth of emails – how many individual are this? I don’t have a clue! Guess we’ll find out as I go along. I’m hoping that brings be down to less than 2-3000. That’s loosing 17 000 emails. How? – Using the Inbox Zero concept. I will be implementing the Inbox Zero system by Merlin Mann. What is the Inbox Zero, you might ask? It’s a simple but great concept of how to handle emails that comes your way. In short it is an system to help you take your email box from overstuffed (like mine) to zero – and then keep it that way. The system cover the skills, tools and attitude that helps you to accomplish this. This concept might, or might not, be for you – but regardless if you have a small or a HUGE mailbox, I strongly recommend you reading about it anyway, even if you believe you have everything under control 😉 There might be an idea or two that could help you in your everyday email life! I could do a quick write up of the concept, but I think I’d rather leave you in Merlin Mann’s capable hands on Inbox Zero instead. I’ve got my weekend cut out for me. You know how sometimes to get rid of one item, you need to do a lot off work first. Today’s item falls into that category. I got a new laptop computer for Christmas. My old one do not function properly any more. In addition since I’m the designated computer help for my mum and step-mum, I need one that works. So what does this have to do with decluttering you might ask. If any of you have ever changed over from one computer to another, you probably know there is some work involved. Like transferring stuff between the computers. That takes time. Well today I’m going to throw one more computer into this mix. This weekends’s task is – transfer my installed SW and documents from the borrowed computer to my new one. Clean up the borrowed one and get it out of the house. I know, it doesn’t sound much.. but I can promise you, it’s a bit of work, especially since it’s also two different operating systems and I might have to change some stuff around to make everything works as intended. How do I go about this? When I have everything sorted and I’m sure I have everything I need, I use an external hard-drive as my transferring media. I use this type of transfer media because I think it’s easy. It gives me a copy of everything just in case. And it means I can choose what to install on the new one right now, and I still have everything on a drive, should I need it later. I start the work on my new one. I install the programs I need, hopefully I can use the SW I already have, if not I try finding updates online. After installation, I activate whatever needs to be activated, so that I can use the programs I’ve installed. 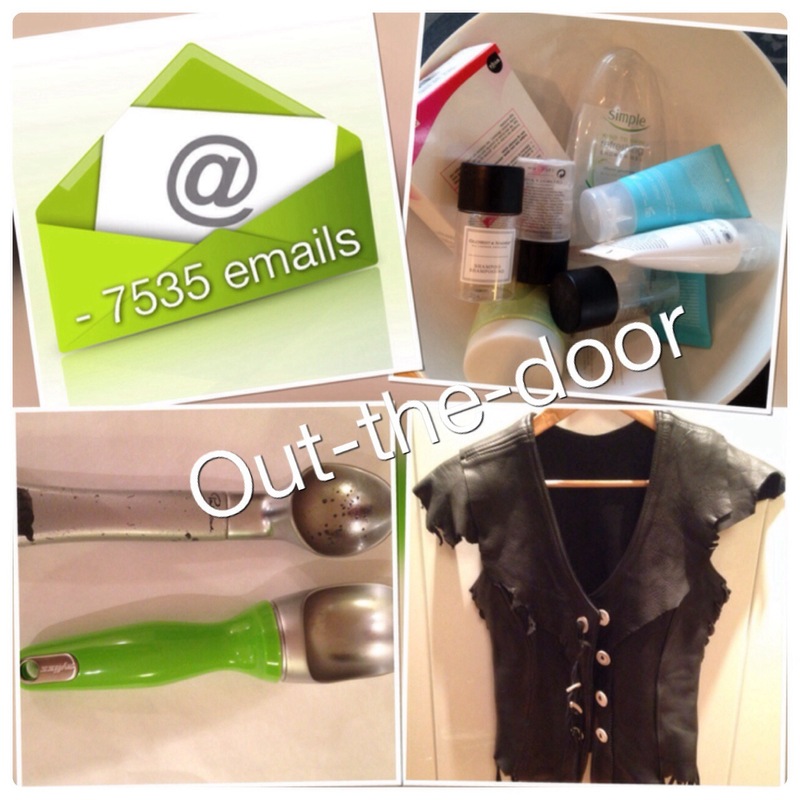 And then I’m ready to go…. I hope! Email clutter stresses me out, and I’ve decided I need to get it in check this year. I’ve tried and tried before but never quite made it, but this year I’ll be ruthless! I’ll be writing a series of posts regarding digital clutter, and a big focus will be on email clutter. I’ve come across this great website, about how to clean up and keep your mailbox in check, called Inbox Zero It has inspired me to make a proper try this year, since I have as many as three mailboxes and they are all overflowing. Over the years I have signed up for things, bought stuff using my email address and signed up for newsletters. Unfortunately leaving your email address out there also generate spam (I’m sure we have all been here) in addition to what you signed up for, and before you know it you’re overwhelmed with emails, and not all of them relevant. Now all I have to do is start tackling my work one.. And that a whole different story that is left for another day…..
How are you doing on unsubscribing and lightening the load of incoming mails? Follow and receive notifications of new posts by email. 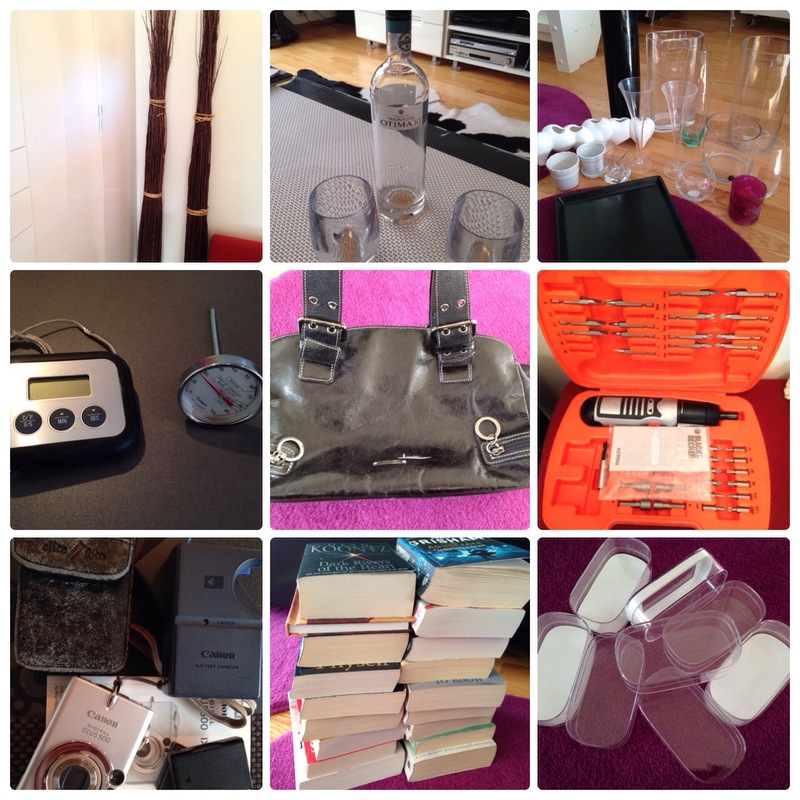 Digital Declutter – March and April! A catch up and some sad news! There is Spring in my step! 21 day challenge - Decluttering this time! Life is like a roller coaster - dealing with chronic pain!